All my neighbours have totally ugly internal decorating, from what i can see from wandering by their windows and noseying inside trying not look suspiciously like i'm "casing the joint"....(very little idea what that actually means)......BUT, they all have really cool doorstep stuff!! 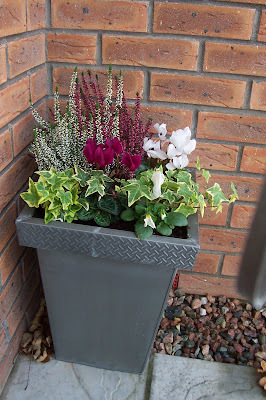 ......Soo i planted up a pot!!! 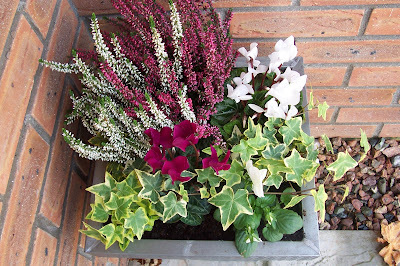 Rasberry ripple alpine heather, pink and white cyclamen, mini white tipped ivy plants and white pansies. I love it, it's so totally cute!! !